Manchester United need to sign a "top-class striker" to lead their attack in place of Wayne Rooney, according to former England winger Chris Waddle. 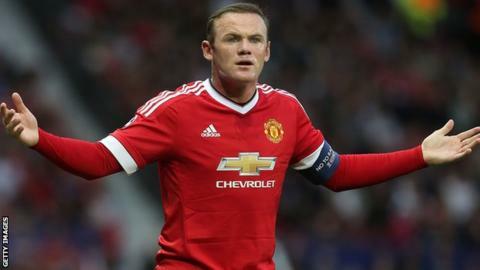 BBC Radio 5 live pundit Waddle believes Rooney, who is yet to score this season following United's 3-1 Champions League win over Club Brugge, is best suited to playing behind another forward. Waddle said: "United are lacking a presence, someone up front who can control the game and score goals. "They need a poacher in the box." He added: "Rooney doesn't seem to have somebody he can play with and that is why they need to buy a top-class number nine for him to play behind." Memphis Depay, who played on the left wing, scored two of United's three goals against Brugge, with midfielder Marouane Fellaini, who came on for Rooney, adding a third. Manager Louis van Gaal claimed last season that United had not challenged for the Premier League title because they lacked a 20-goal striker. Since then, the Dutchman has allowed Robin van Persie and Radamel Falcao to leave and has not signed a replacement, although Javier Hernandez has returned from a loan spell at Real Madrid. Captain Rooney has played as United's most advanced player in their first three games this season. The England international, 29, stretched his goalless run for his club to nine matches before being replaced by Fellaini, who headed United's final goal in their play-off first-leg win over Brugge on Tuesday. Waddle added: "At the moment Rooney is lacking confidence. He is isolated and doesn't look composed in front of goal. "He is physical, he's got good pace and a great range of passes, which is why he's best played behind the striker. "Van Gaal keeps saying he's got four centre-forwards and doesn't need another one. I think he's got four number 10s. I don't think he's got an out-and-out number nine." As well as Hernandez, who came on against Brugge, teenager James Wilson is United's other striking option.